“StairsInwards” is a video installation made by the choreographer and dancer Thembi Rosa in partnership with the filmmakers Lucas Sander. 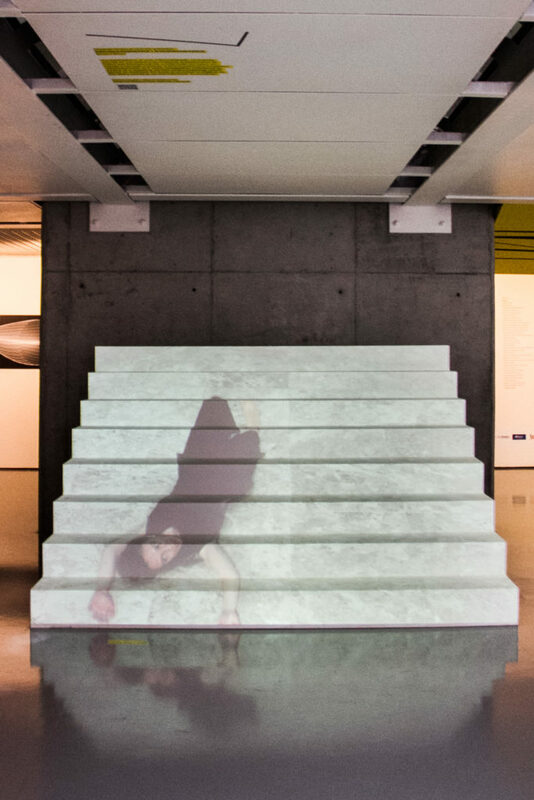 This video installation was designed to be project in stairs in a system of mapping that keep the whole body into the stairs bringing up unpredictable movements to this surface. Thembi Rosa is a dancer and choreographer. She has a master’s degree in dance by PPG Dança of UFBA (2010) and a graduation in Literature by UFMG. Since 2000, she performs dance projects in partnership with O Grivo, with invited choreographers and dancers. She is part of Dança Multiplex with Renata Ferreira and Margô Assis, and the Project Interferências, a nomadic community created by more than 20 artists of several countries. www.dancamultiplex.com.br. Lucas Sander works in the field of audiovisual as a director, editor, finisher and digital artist. He directed the short films Caixa de Pandora, in partnership with Paula Santos, Funeral for a friend, with Milan Pingel and Leonardo Amaral. He participated of several works of the director Cao Guimarães as editor, finisher, photographer and assistant director. He is a founding member of the audiovisual collective Tauma.